but I’ve got a yen to review a uber-comfortable, warm and cozy slipper. My husband and I just got back from vacation and one of my secret fascinations is the airplane’s SkyMall magazine. From the “temperature regulating pet bed” to “the healthiest deep fryer” to the “the motion mimicking robotic pugilists” – I’m fascinated! 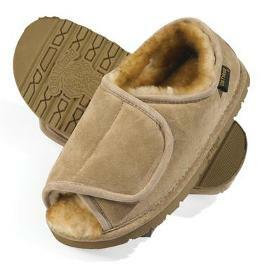 The Adjustable Sheepskin Slippers are made from Mongolian Sheepskin and have a cushioned sheepskin insole with a rubber outsole that provides stable footing. I particularly like the adjustable top for anyone who has problems with swollen feet and this slipper is especially recommended for any patients suffering with diabetes, neuropathy or peripheral arterial disease. Needless to say, I highly recommend this slipper!